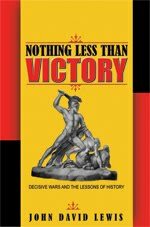 While reading Nothing Less than Victory: Decisive Wars and the Lessons of History by John David Lewis the other day, I came across something that I knew immediately I needed to post here. In the chapter about William Tecumseh Sherman, Lewis examines Sherman's goal-directed actions as he planned and executed his march through the South, and how he refused to make sacrifices or take any irrational actions that might stand in the way of his ultimate goal. For instance, he did not get bogged down in any battles over entrenched positions. Most of all, he had to keep a firm eye on his strategic goal, to get from Atlanta to the sea, and then to move north to meet up with Grant. This goal would take precedence over secondary targets, such as taking a city like Augusta; it was the end point that must not be forgotten. All else was a means to an end. The sentence I highlighted above could be a motto for a successful life, let alone an effective and principled way to wage war. It can apply broadly to any goal-directed action. Do you want to find a new job? Save for a vacation? Write a book? Lose weight? Identify your goal, your long-range purpose, develop an integrated strategy taking into account all variables, possible conflicts, and most importantly your principles, and then keep your eyes open for any tactical measures that will move you relentlessly toward your goal. Note that this is in no way being pragmatic. An integrated strategy means that it relies on principles, values, and morals, and any particular tactic that would violate those would not ultimately move one closer to his goal. The moral is the practical when one's morality is egoistic and one acts based on reason. A firm goal and fluid actions to attain that goal are not incompatible; flexible tactics within an integrated strategy can achieve an inflexible purpose. > "A firm goal and fluid actions to attain that goal are not incompatible; flexible tactics within an integrated strategy can achieve an inflexible purpose." 1. One's central purpose in life is an inflexible purpose. However, the same CPL can be achieved in a myriad possible ways, places, and styles. For example, Ayn Rand's CPL was to portray the ideal man in fiction. She could do that anywhere in the world where there was freedom to write. She could write short stories or novels or screen plays. And so forth, with the details varying according to circumstances and opportunities as they arose. 2. A concept is inflexible in its purpose, which is to help us grasp certain kinds of existents in the world around us. The concept chair is valid whether one lived in Europe 500 years ago, the USA today, or Argentina 500 years from now. The details subsumed by the concept can vary greatly but still be subsumed by the concept, which is formed for a purpose. Abstractions help us deal with the multitude of details in reality. Abstractions stated as purposes help guide us in a life filled with a forest of possibilities. Thanks Burgess. I'm glad you weighed in, because I actually had your CPL ideas, and Trey's recent grappling with a CPL, in mind when I wrote this post.